Please note that the content of this book primarily consists of articles available from Wikipedia or other free sources online. 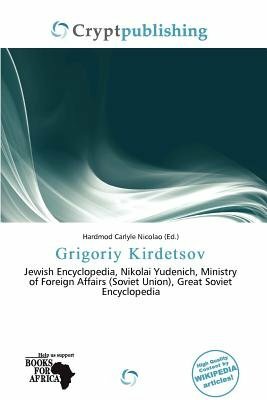 Kirdetsov Gregoriy L'vovich Dvorzhetskiy (1880 - 1938 was a public worker, journalist, the translator of Italian social and political literature. He collaborated in the "Jewish Encyclopedia" until 1917. During the First World War he was a correspondent for the newspaper "stock exchange lists" in Copenhagen, Denmark. Fall 1917, he evacuated his nephew, the Count Constantin Pavlovich Borodin (Saint Petersburg, Imperial Russia October 20 1907- Brussels, Belgium, March 28 2007) from Saint Petersburg.